Recently, Nose High School was honoured to be nominated in the “Agricultural High Schools and Colleges Website Awards”. The ceremony was held at Keio University Sanda campus on Tuesday March 28th. We were represented on the day by our vice-principal Mr Uchida, and alumnus Ms Matsuda. Nose HS was among 384 agricultural high schools and 47 agricultural colleges invited to the event. We are very happy that not only the content of the website but also our effort towards education itself have not gone unappreciated. This has encouraged us to further our development towards activities with the local and international communities, and to keep the world updated on these activities through our website. On Wednesday December 7th, we held our Second Years’ 45th SG focused-area lecture for the Super Global Study class. We welcomed as our lecturers Kazuko and Teruhisa Saito, a couple who run a fair-trade shop called “Espero”. The theme of the lecture was “fair-trade honey and community trade”. Mr and Mrs Saito, who have experience of living in Indonesia, opened Espero in the town of Minoh in 2010 before moving to Nose for a new start in December of 2015. They renovated a 100-year-old traditional Japanese-style house, and opened “Espero Nose” in the Jioh area. 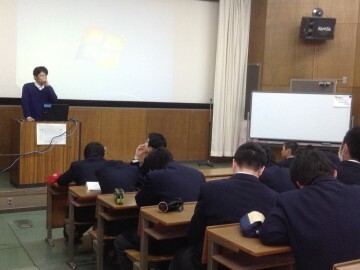 In the session, each group explained briefly to Mr and Mrs Saito about the presentations they are working on. In line with the presentations, they showed us some goods they sell at the shop, including handicrafts made by street children in Thailand, Nepalese and Ethiopian honey in cutely designed bottles, and beeswax candles and crayons. It was very helpful to see all the goods when trying to come up with good ideas for the creation of local specialities of Nose and Shaamar. Next, Mr and Mrs Saito explained to us the general idea of fair trade and community trade. Examples of community trade include the self-sufficient life cultivated in Kusunoki Clean Village in Yamaguchi prefecture, where roasted green tea known as hojicha is grown without pesticides, and bamboo bicycles and speakers made by Mr. Singgih, an Indonesian industrial designer living in the Yamaguchi area. These products are eco-friendly and innovative. Although there are problems in Nose such as depopulation and abandoned farmland, Mr and Mrs Saito discovered new possibilities here and are now engaged in international cooperation. Their positive attitudes encouraged us greatly to be more enthusiastic about our research projects. We learned that the actions and efforts of high school students do make a difference, and that it is important to start from what we can do now and progress from there. During the first and second lesson periods on Wednesday November 30th, we held our Second Years’ 43rd SG focused-area lectures. The theme tackled by Group 1 was “Poverty and street children”. We created the presentation from three angles: “What is poverty? What is a street child?”; “How are street children supported by the government, local authorities and NGOs?”; and “What can we do for street children?”. Group 2’s theme was “Furusato Development in Shaamar.” Throughout the course of the 2000s, no small number of Mongolians moved from their “furusato” – a Japanese word roughly analogous to ‘rural hometown’ – to the capital looking for work, and the depopulation in rural areas was a serious matter. We dug into the issue of rural-urban migration and discussed what could be done for the local people to help allow them to live creatively. We made use of the information available on the day as well as our own impressions drawn from our field study in Mongolia. Group 3 were tasked with “Furusato development in Nose”. Just as in Shaamar, depopulation is a very real problem in Nose. We tried to make plans for regional revitalization in our town, making full use of our project research in Mongolia. The research projects of the three groups are all going smoothly ahead of the final report. On 16th November, we held the 42nd SG focused-area lecture during the first two lesson periods of the day. Advising on this occasion was Prof Ryoko Imaoka from Osaka University, who helped our students with their research projects. In the first class, the students practised for the mid-term presentation of our research projects, which they are due to give in one week’s time. Prof Imaoka said that a good presentation should be in the presenter’s own words, not simply citations from references, and that it should be delivered with an adequate amount of emotional expression. After hearing from Prof Imaoka, the students formed two groups to give the English-language presentation about fieldwork in Mongolia and the Japanese-language presentation about beekeeping in Shaamar County. They used PowerPoint, in a dress-rehearsal of the mid-term presentation session itself. In the second class, we watched back a recording of the morning’s presentations. While reviewing the videos, the students actively discussed how to improve their presentations. They commented on the relaxed nature of one of the talks, and gave suggestions when they felt that presentation styles had been quiet or monotone, or when they lacked some pace control. We didn’t have too much time for the mid-term presentation session, but the students were able to participate in some active discussion around improve their skills. They will continue polishing their presentation and delivery in order to give the best performance for the day. On Wednesday November 16th, we held our Second Years’ 7th SG basic knowledge lecture. We welcomed as our lecturer Mr Katsuhiko Ogino, a staff member at Minoh Association for Global Awareness (MAFGA). The theme of his lecture was “Racial issues and human rights in the United States”. He talked about racism against black people and about the U.S. as the world’s superpower, based on his six years of work experience in the country. We were also very impressed by his talk on Japan-U.S. relations. An admiral of the Imperial Japanese Navy in 1945 said that the Japanese Instrument of Surrender written by the U.S. was totally unacceptable and made them revise it immediately after the announcement. Even though Japan was defeated, the Japanese Admiral said what he had to say to the U.S. for the future of Japan. The Americans in charge agreed to his logical requests and rewrote the document. They all had shared sense of coherence and rational thought. At the end of the lecture, Mr Ogino taught us some crucial factors to enable effective communication: language skill; logical thinking and persuasive, rational arguments; cross-cultural understanding leading to a greater generosity toward those different from us; passion; and possessing a firm, solid personality. Keeping his words in mind, we held a discussion session, where student groups presented their opinions about two case studies. It was a great opportunity to think about importance of expressing opinions to others while avoiding offending the other party. We had a very productive and thought-provoking day attending the lecture and the workshop. It will encourage us to think globally by getting to know about human rights, international understanding, and understanding self and others. On Thursday 10th November, we invited Mr. Kenta Kawai from the Kinki Branch of the Japanese Overseas Cooperative Association (JOCA) to deliver the First Years’ 11th SG Basic Knowledge lecture. Mr Kawai’s lecture was about volunteer programmes with organisations such as JOCA and JICA, the Japanese International Cooperation Agency, as well as his own volunteering experiences teaching water polo in Indonesia. He encouraged the students to believe that they can contribute to international cooperation with all kinds of specialties. Mr Kawai also told us of the many differences in the lifestyles between Indonesia and Japan, and of his failed attempts to push the Japanese way of life onto the locals. Those stories made quite the impression on our students, and may help change the way they think about foreign countries and different cultures. The main lesson he wanted us to take from his lecture was that the idea of international cooperation is not to provide aid, but rather to increase understanding across borders. This was certainly an inspiring sentiment for our students. During the first and second lesson periods on Wednesday October 12th, we held our Second Years’ 34th SG focused-area. The theme this time was “How to build a sustainable business: investigating local needs from a global perspective”. We were given treated to a lecture and workshop by Kaori Hamaguchi, the manager of the Osaka branch of a company called Motherhouse. After graduating university, Ms Hamaguchi took on an overseas assignment as a member of the Japan Overseas Cooperation Volunteers in Nepal, before working for a time at the Nepal office of JICA. She has been working for Motherhouse since 2012. The company is engaged in the planning and production of apparel products and general goods in developing countries, and also gives quality guidance and sells the goods in developed countries. In the first session, we reviewed our current work on Nose town and Shaamar in Mongolia. We heard about how important local businesses are to the two areas: industry holds the key to regional revitalization, job creation, anti-poverty programmes, and increase in average income. We were told that just starting businesses was not enough, but that we should keep them sustainable for them to be effective. Sustainable business could not exist without a well-balanced cycle of procurement and product development, production and processing, distribution, sale, securing profit, and investment and revenue. Ms Hamaguchi explained the process of hand-spinning raw silk stoles, and gave us some tips for success using the stoles as an example. The stole business was a project that Motherhouse started in Nepal, a country with a great deal of poverty. Through this example, we were able to see what is important in keeping business sustainable: a shift from stereotyped images to new ideas, building a production system suitable for the environment, and local branding. For the workshop, we were joined by three exchange students. We divided into four groups and tried to create brand images for Nose town and Shaamar. Each group split their manpower to work on Nose and Shaamar in separate teams. We discussed and made presentations on how to increase the appeal of a place by looking for new value in things we have come to take for granted. Although it was difficult for us to find the attractive things about old products, our visit to Mongolia enabled the students to look at Nose Town through an unfamiliar lens. We also learned how to create a business plan from a global perspective. It will be important for us to utilise this method in our research project. On Wednesday October 6th, we held the Second Years’ 5th SG Basic Knowledge Lecture. The lecturer was Prof Yoko Inui of Osaka Kyoiku University. Her lecture was entitled “Ecology of the Malaysian Rainforest”. She taught us that the South East Asian rainforest has one of the most historical and diverse ecologies in the world, with higher trees than rainforests elsewhere, and gave us information on the year-round hot and wet climate of Borneo. Prof Inui also told us that ecology of Malaysia has been drastically damaged by plantations and other human activities, which have left National Preserves as the only untouched forests in the country. The number and variety of endangered animals have also been increasing at a much faster rate than efforts to reverse the trend have been able to counteract, with the creation of registered nature conservation areas and the ratification of United Nations Framework Convention on Climate Change not having the desired effect. It was shocking for our students to realise that human beings have brought the forests to the point of no return. We hope that this lecture will encourage them to consider what they can do to help the rainforests, one of which they will visit during the school trip next January. During the first and second lesson periods on Wednesday September 28th, we held our Second Years’ 32nd SG focused-area lectures for the Super Global Study class. We continued preparations for our Japanese-language presentations at the Consulate General of Mongolia in Osaka on Monday October 3rd. In the first session, as last time, each group edited photos and examined and edited their presentations to make them easier to understand and more accurate. In the second session, each group rehearsed and worked on the timing of the the delivery of their presentations. They tried to talk at the best speed and as well as possible, and practised changing slides at the right time. We realised that we should speak loudly and clearly enough for everyone to hear and understand, since microphones will not be available on the presentation day. We also worked on making eye contact. We have been pretty busy and will get busier still, with preparations for our English presentations and preparing to exhibit materials for our school festival, on top of the upcoming presentations at the consulate. We are working hard cooperating with one another. For the first two lessons of Wednesday September 21st, we held our Second Year Super Global Study class’s 31st SG focused-area lecture. Associate professor Ryoko Imaoka from Osaka University was here once again to help with our research. In the first session, each group edited the contents of their presentations in Japanese and practiced their presentations for the upcoming visit to the Mongolian Consulate. We also added new photos and questionnaire results to the slides of the PowerPoint presentation and summarised the scripts. In the second session, each group delivered their presentations. The first group presented on the history and current situation of beekeeping in Shaamar County, Mongolia. They will use the information we gained from surveys on the field study in Shaamar in the presentation. The next group explained how honey bees play an important role in our ecology, and how beneficial they are to humans. They also described the life of a beekeeper, and outlined the annual schedule of beekeeping activities in Nose High School. The last group reported about their comparative research on the climate, local products, and school life in Nose town and Mongolia. Professor Imaoka gave some advice on the work of each group, including how to edit data in presentations and how to create a strong, consistent voice. We’re growing more and more enthusiastic in our practice, looking towards the presentation at Consulate General in Osaka. On Monday September 12th, we invited staff members from an ‘agricultural guesthouse’ called Michikusa to deliver our Basic Knowledge lecture. The staff members joining us were Ms Mikami and Mr Yokoyama. Their guesthouse has a range of agricultural activities that its guests can enjoy. Their lecture was entitled “Becoming a backpacker, and starting a new life in Nose’s old house”. Mr Yokoyama began by talking about the path his life has taken to this point. He used to work in computing, but since he met Ms Mikami and saw how each day can be enriched through agriculture, he developed a new viewpoint on life and the meaning of work. He also talked how he started a family. Ms Mikami then introduced herself, and conducted a workshop on “self-chronology” – creating a timeline of your own life. For our students, reviewing their lives, considering their ambitions, and setting goals for the future allowed some time for self-reflection. During the first and second lesson periods on Wednesday September 14th, we held our Second Years’ 30th SG focused-area lecture for the Super Global Study class. Associate professor Ryoko Imaoka from Osaka University was here to assist with our research. We prepared and practiced presentations about Nose town and our field study in Mongolia, with a view to our visit to the Consulate General of Mongolia in Osaka on Monday October 3rd. The three groups reorganised the contents of their presentations and reported on their progress. One group will make comparisons of climate and the population between Nose town and Mongolia and introduce local products of the two areas. Another will present on beekeeping and beekeeping jobs in Nose town. The other will report on beekeeping in Shaamar, Mongolia, and the current economic improvement supported by the beekeeping business. After hearing one another’s progress reports, each group shared their thoughts for improvement, pointing out what is needed to make the presentation easier to understand from the standpoint of someone listening to it for the first time. Finally, we received advice from Professor Masato Kotani of Kwansei Gakuin University. After watching our class, he left us with the comment: “You should think what message you want to give to the audience when you make a presentation, and speak while keeping the message in mind at all times. Otherwise, it will be difficult for the audience to appreciate the contents or photos no matter how great they might be”. In today’s class, we learned the importance of delivering a message in a comprehensible way by putting ourselves in the audience’s shoes. We tried to think that way when planning the presentations, and hopefully we were able to upgrade our skills by learning from other students in the audience. On Wednesday 7th September, we hosted Shohei Kotsuji, Director of Corporate Social Responsibility (CSR) Promotion division of Saraya Co., Ltd. Mr Kotsuji was visiting to give to 4th lecture of the Second Year’s SG basic knowledge lecture series. The topic this time was the palm oil industry and conservation activities in Malaysian Borneo. Saraya is well-known as the producer of Yashinomi Sekken – a palm oil liquid-soap – the palm oil for which comes from Borneo. Beginning on the topics of Malaysian history and culture, Mr Kotsuji told us that palm oil extracted from oil palms is widely used in food and household items around the world, including in Japan. He talked about the complicated reality and conflicting benefits and drawbacks of palm oil production: the industry provides 600,000 people with work opportunities, yet ever-increasing palm plantation areas lead to the exploitation and destruction of rainforest. Due to these plantations, the ecosystem of Borneo has been severely damaged is losing its biodiversity. Mr Kotsuji then outlined Saraya’s efforts to balance its involvement in industry and environmental conservation. While still producing goods using palm oil, the company has associated with some local environmental conservation NGOs as part of its CSR activity. Our students will visit Taman Negara, a national park on the Malay peninsula, on their school trip to Malaysia next January. Today’s lecture gave the students some important information about the situation of the tropical rainforests in the area. On Monday 5th September, we welcomed Ms Yukiko Nomoto, a student of Mongolian at Osaka University School of Foreign Studies, to give the First Year’s 5th SG basic knowledge lecture. The intention of the lecture was to foster international understanding, with the theme “Living in Mongolia Today”. Ms Nomoto told us in detail about her visit to Mongolia for 3 months last year, as well as some basic information about the country such as city names, and the meaning of the national flag. Our students seemed to be surprised at differences in the culture and the Mongolian people’s perspectives. The pictures Ms Nomoto showed us were impressive, with one in particular capturing a beautiful starry Mongolian night sky. Their interest in the country piqued, our students asked many questions after her talk; Ms Nomoto’s answers were quite enlightening! During the first and second lesson periods on Wednesday September 7th, we held our Second Years’ 28th SG focused-area lectures for the Super Global Study class. Professor Ryoko Imaoka from Osaka University was in attendance to help us with research based on our fieldwork in Mongolia. We improved the presentation we gave in Mongolia by updating information from the field study and adding photos that we took while on the trip. We also included our personal observations and our opinions of the experience. We are planning to do a presentation, exhibit materials, and offer a honey tasting at the school festival in October. In addition, we will have the chance to visit the Consulate General of Mongolia in Osaka to give a presentation on the subject of Nose town, and give a report on the field study in Mongolia. Now that our trip is over, it is time for us to make progress on our research for the mid-term report in November and the final report due in February, incorporating all that we saw, felt, and experienced in Mongolia. To deliver this lecture and lead the workshop, we welcomed actor and businesswoman Ms Yuka Tsukita, president and CEO of Cheers Inc – a human asset development company. Ms Tsukita founded Cheers Inc with the hope of utilising theatre techniques to foster human resources in companies. She is now playing active roles in various fields, and is currently travelling back and forth between Thailand and Japan, seeking the best ways to cultivate human resources in Thailand. At the beginning of the first half, we learned about the demographics of and living conditions in Thailand: the population, domestic situation, wages, prevalence of Theravada Buddhism, and the fast-growing economy. We also learned that Thai people have a very positive view of Japan and enjoy consuming our culture, from Japanese food and kimono to anime and idols. Next, we divided into groups and discussed what is important for Japan and Thailand to achieve an even better relationship. The year 2017 marks the 130th anniversary of Japan-Thailand diplomatic relations. We came to know that what matters is to build a win-win relationship, which would be the best for both countries, shifting from the current situation centred around Japanese support for Thailand. In the second half of the day, we had a workshop on the third Japan Expo Thailand which will be held in 2017. Japan Expo Thailand is one of the biggest Japanese culture festivals in Asia. We divided into three groups, and each brought ideas to the table on their own themes: culture, industry, and sightseeing, using the concept of Nose High School running a booth to introduce and advertise Nose town at the festival. We came up with some uniquely Nose ideas: a joruri puppet theatre booth where you can enjoy both seeing and playing in a show; a tasting booth where you can try local delicacies of Nose town such as rice, chestnuts, sake, and sparkling water; and a sightseeing booth where we would display beautiful scenes of the town and provide information on tours using postcards and brochures. Ms Tsukita is actually thinking of applying to attend the Japan Expo and setting up a booth. There is a chance that our ideas will be put into practice. The class today was a good opportunity to consider which parts of the tradition and culture of Nose town we most want to show to the world. During the morning of Wednesday August 3rd, we held our Second Years’ 23rd and 24th SG focused-area lectures for the “Super Global Study” class. Today’s class was held at our school farm. In the first half, Ms Matsuda gave us a lecture on the final process of beekeeping and harvesting honey. We removed the hive frames from some beehives. The hive frames were full of honey and had hard beeswax on the surface. We worked in pairs and tried to slice off the beeswax carefully and as thin as possible using heated uncapping knife. We then put the hive frames two at a time into a centrifugal machine and extracted honey. A hive frame weighs about 2kg, which we found quite heavy. We rotated the handle of the machine, which was no easy task. When we had extracted all of the sweet-scented honey, we put passed it through a strainer to remove scum, and bottled it, taking a moment to appreciate how lucky we were to be able to harvest such a good quality product. Today’s activity should provide valuable experience for our upcoming field study of beekeeping in Mongolia, for which we will depart this weekend. In the second half of the session, we welcomed Ms Tulgaa Enjgee, a Mongolian graduate student of Osaka University, as our lecturer. We learned about the foundation and current activities of a gender centre in Mongolia that we are planning to visit on August 10th. In the 1990s, Mongolia went through a great change during the transition from socialism to capitalism, in the midst of which, in 1996, a centre offering information and assistance for women was founded. During the process of introducing capitalism, companies were privatised one after another and went bankrupt, unable to keep their business running. As a result, many people lost their jobs and moved from rural areas to the capital, Ulaanbaatar, to look for work. In the city, women and children fell victim to poverty and violence. To tackle this difficult situation, the Gender Centre for Sustainable Development was founded. In addition, a centre supporting various activities with the goal of community revitalization was founded in Khoroo thanks to donations from generous benefactors. People in Ulaanbaatar found it difficult to improve their access to infrastructure because they were living in poverty. The centre in Khoroo encourages people to work and live by their three mottos: “The right for our residents to live as human beings”; “ Encounters, connection, and cooperation between people”; and “Learn technology and get out of poverty”. During our visit to Mongolia, we will visit the centre and give them donations we collected at our school festival. We will also give our presentations there, and interact with the local children. Making a contribution to the centre is one of our goals for our field study. On the morning of Wednesday July 27th, we held our Second Years’ 19th and 20th SG focused-area lectures. In the first half, we continued our preparations towards our English presentations in Mongolia. We fine-tuned and rehearsed our presentations under the guidance of Ms Ryoko Imaoka, an associate professor of Osaka University. This time, Ms Haruka Tonegawa also attended the sessions to give us help. Ms Tonegawa is a translator and an interpreter, and attends Professor Imaoka’s academic conferences. Our teachers gave advice on areas such as pronunciation, rhythm, intonation, volume, and accents, and we had plenty of chance to practice. We practised thinking about the message we most want to convey to the audience and how we can make ourselves understood, and gradually we became able to speak in a stronger voice. At the end, we gave PowerPoint presentations, which we were able to tackle with confidence. In the second half, Mr Hidemasa Wakitani, Nose HS Farm’s agricultural engineer, gave us a lecture named “Beekeeping and the World”. We learned about the relationship between bees and humans from the 6th millennium BC to about 160 years ago, from the earliest records of working with bees right through to the establishment in the United States of modern beekeeping. We studied the characteristics of modern beekeeping in the United States, China, Argentina, and Turkey. Mr Wakitani also told us about beekeeping in Australia from his personal experience, especially about raising queen bees. He talked about his intercultural communication with the local people and gave us some travel tips, showing us photos of Australia. We have now heard about beekeeping in the wider world, as well as in Mongolia and Japan. We will continue to compare them and utilise our new knowledge in our field study in Mongolia in August. On Tuesday July 26th, we held our Second Years’ 8th SG English presentation lecture. We practiced and rehearsed our English presentations in groups for our upcoming visit to Mongolia in August. Our lecturer today was Ms Naoko Nadtochiy, brought up in Nose town and currently living in Kansas, United States. She gave each of us detailed comments on our English pronunciation and accents. Over the course of our presentation practice, we have come to realise that it is crucial to face the audience in order to show them our expressions, and to speak in a strong voice so that the audience can hear us. We received good advice from today’s teachers, which we think will be useful when practicing for the presentations in Mongolia. On Wednesday July 13th, we held our Second Years’ 3rd SG basic knowledge lecture. We invited Ms Uze Cathrine, a French woman currently staying in Japan, and Ms Sayaka Kano, a translator and interpreter, to be our lecturers. Miss Kano’s daughter Emma, a primary school student, also joined the lecture with us. Ms Cathrine works as a travel coordinator in Marseille. Ms Kano teaches Japanese in Marseille and is married to a Frenchman. Her daughter Emma is multilingual, speaking French, Japanese and English, and is currently learning Spanish. After they introduced themselves, Ms Cathrine gave us some general information about France and a more detailed background on Marseille: its history, culture, customs, public order, sport, and the lifestyles of high school students, occasionally testing our knowledge with questions. She told us that Marseille is a sister city of Kobe, and also provides the setting of Alexandre Dumas’ popular novel “The Count of Monte Cristo”. Her talk was really interesting. We learned that a lot of French people are Japanophiles, as evidenced by the incredible popularity of manga, anime, Japanese character cosplay, and Japanese food. Today’s lecture was eye-opening: it made us realise that interacting with people from different cultural backgrounds is a great opportunity to rediscover the good things about Japan. On Wednesday July 13th, we held our Second Years’ 16th SG focused-area lectures for the “Super Global Study” class. Today’s class was held in the LAN classroom. As last time, we divided into three groups and continued preparations towards our English presentation in Mongolia in August. This time, we had two teachers: Ms Ryoko Imaoka, a professor in the School of Foreign Studies at Osaka University; and Ms Haruka Tonegawa, a translator. We started creating the presentation in English under their guidance. Ms Tonegawa studied abroad to find her path in life, while majoring in English at Osaka University. Since her graduation, she has travelled extensively, and is now working as a freelance translator. She also works as an interpreter, attending Professor Imaoka’s academic conferences. While preparing the presentations about beekeeping in Mongolia and about Nose town, we translated material and data from Japanese to English. Ms Tonegawa gave us detailed guidance on translating, including useful tips, how to write a well-structured English sentence, and so on. It required focus and patience to find an appropriate translation for each Japanese word, continually referring to a Japanese-English dictionary and the Internet. However, the group members helped each other and asked the teachers plenty of questions to solve any problems they had. We made good progress, and are almost done with the translation at this stage. We are making steady progress in the preparation for the upcoming presentation! On Tuesday July 12th, eleven Second Year students on the SG focused-area lecture program, along with our exchange student Jean(Gene? ), visited Tottori University of Environmental Studies. In the morning, we studied in the university’s English Village. We started by chatting in English, before taking part in geography quizzes with Emmanuel from Guinea, and the baking cookies in a class given by Sarah from Sudan. In the afternoon, we took part in the research seminar given by Professor Fumio Nakahashi. The students in his seminar gave a report on the investigation of the Kumamoto Earthquake. 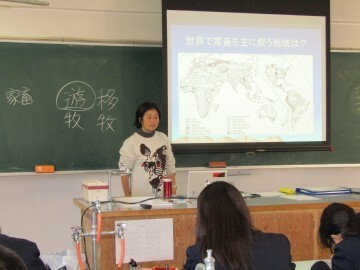 Finally, Professor Kadono gave us a lecture about the soil of Inner Mongolia. On Monday July 11th, we invited two Thai university students to our First Years’ SG English Presentation Lecture, which was delivered by Shigemi Imanaka. The students were from the engineering department in Chulalongkorn University, and were on a homestay in Nose Town with Ms Imanaka. While here, they studied rice cultivation in the local area. While they took a keen interest in agriculture, their decision to study in Japan was also due to their passion for many aspects of Japanese culture. Both of them proved a great help as Ms Imanaka’s assistants during the lesson. Firstly, after they introduced themselves in English, they answered our students’ questions and asked their own. 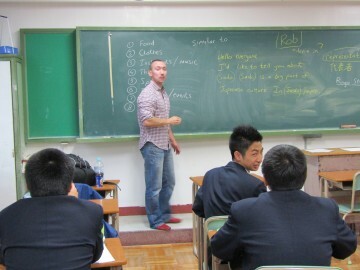 The Nose students were a little tense at first, but they overcame their nerves thanks to the friendliness of our guests. The Chulalongkorn students gave a presentation introducing Thai culture, including photographs of famous temples and the Songkran festival. We learnt a lot about the culture and lifestyle of Thailand, and our students had another valuable chance to practise their English in a real-life environment. On Thursday June 30th, we held our First Years’ SG 3rd basic knowledge lecture. We welcomed as our lecturer Toshiharu Shimizu, the head of the Organization for Industrial, Spiritual and Cultural Advancement (OISCA) training center in Kansai. Mr Shimizu introduced the present situation in South East Asia and talked about the “Children’s Forest Program”, which was vital in restoring life to the region’s woodland. We watched a slideshow on why this program succeeded from among many, and how life changed after its success. Mr Shimizu also introduced other programs such as “One-month Volunteer Activities for College Students” and “Domestic Tree Planting Activities”. In addition, he talked about more familiar volunteer work such as separating rubbish, economising supermarket checkout bags and supporting the Children’s Forest Program by collecting Bell Marks. It was a good way to highlight the links between the little things the students can do every day with an awareness of the environment on a global scale. To finish, he explained that the main work of OISCA is “human resources training”. OISCA’s activities are not intended as temporary support: its role is to train community leaders and encourage self-reliance. He told the First Years that students in the years above them at Nose HS have been developing as community leaders, supporting Nose Town through SGH and overseas training. OISCA does some really important work in overseas development and it does it excellently. We hope that the students will take on board the lessons from this valuable experience and may consider volunteering themselves. During the first and second lesson periods on Wednesday June 29th, we held our Second Years’ 15th focused-area lecture. This time, Ryoko Imaoka from Osaka University gave us help with research. Our students were divided into three groups to prepare for their upcoming presentations at the National University of Mongolia, the Mongolian University of Science, and the Technology and Mongolia Gender Center. 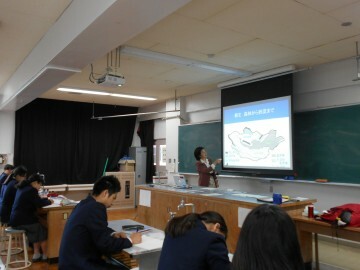 In a LAN classroom, Ms Imaoka explained the schedule for creating the presentations and the process of preparation and practice. There are three presentation topics: an introduction to Nose town, beekeeping in Nose High School, and beekeeping in Shaamar County. The groups started work right away. They collected materials on beekeeping and translated them into English together. The research trip to Mongolia is only a month away, so the groups will need to focus hard on their topic until then. On Wednesday June 29th, we welcomed as our lecturer Daisuke Kawai, a staff member at Minoh Association For Global Awareness (MAFGA). Mr Kawai was delivering our Second Years’ SG 2nd basic knowledge lecture. 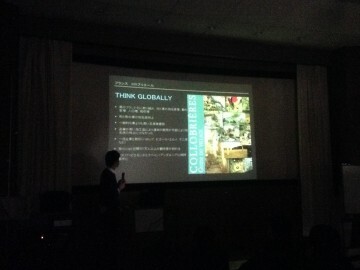 His speech was about the situation of foreigners living in Japan as seen from his position as MAFGA staff. In the first half, he introduced MAFGA’s activities geared towards creating a multicultural society. He arranged a workshop, in which , our students were able to get a taste of situations that some foreigners struggle to comprehend. Mr Kawai told us that there are three barriers for non-Japanese living in Japan: the language barrier, as language is the basisc of living in a society; the system barrier, as Japan has no immigration policy; and the internalised barrier of the Japanese people-, which will result in discrimination. In the second half, our students took a workshop wherein they were tasked with explaining the school paper to foreign parents who could hardly understand Japanese. Each group taxed their ingenuity in preparing and presenting their own English-language version. They realised that there were two important points: ease of understanding, and catering to the fact that these parents might need extra help in navigating the Japanese school system. We hope that the students’ experience with MAFGA today has helped them think about some issues of a multicultural society that they may not have considered before. On Tuesday July 12th, eleven Second Year students on the SG focused-area lecture program, along with our exchange student Jin, visited Tottori University of Environmental Studies. Mr Shimizu introduced the present situation in South Eeast Asia and talked about the “Children’s Forest Program”, which was vital in restoreing life to the region’s woodland. We watched a slideshow on why this program succeeded from among many, and how life changed after its success Mr Shimizu also introduced other programs such as “One-month Volunteer Activities for College Students” and “Domestic Tree Planting Activities”. In addition, he talked about more familiar volunteer work such as separating rubbish, economising supermarket checkout bags and supporting the Children’s Forest Program by collecting Bell Marks. It was a good way to highlight the links between the little things the students can do every day with an awareness of the environment on a global scale. To finish, he explained that the main work of OISCA is “human resources training”. OI SCA’s activities are not intended as temporary support: its role is to train community leaders and encourage self-reliance. He told the First Years that students in the years above them at Nose HS have been developing as community leaders, supporting Nose Town through SGH and overseas training. 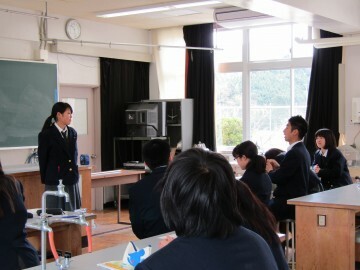 In a LAN classroom, Ms Imaoka explained the schedule for creating the presentations and the process of preparation and practice. There are three presentation topics : an introduction to Nose town, beekeeping in Nose High School, and beekeeping in Shaamar County. The groups started work right away. They collected materials on beekeeping and translated them into English together. The research trip to Mongolia is only a month away.so the groups will need to focus hard on their topic until then. In the first half, he introduced MAFGA’s activities geared towards creating a multicultural society. He arranged a workshop, in which , our students were able to a taste of situations that some foreigners struggle to comprehend. Mr Kawai told us that there are three barriers for non-Japanese living in Japan: the language barrier, as language is the basise of living in a society; the system barrier, as Japan has no immigration policy; and the internalised barrier of the Japanese people-, which will result in discrimination. We are honored to welcome three teachers, Mr Robert Normile, Ms Shigemi Imanaka and Mr Timothy Kern, to the SG English Presentation lectures this year. Continuing from last year, Mr Normile is in charge of the Second Years’ SG English Presentation lectures. We have held a 2 hours class on Tuesdays, around twice a month, this year. Mr Normile is from Liverpool, United Kingdom, the hometown of The Beatles, and graduated from the University of Liverpool’s School of Engineering. After his graduation, he spent some time working in Australia before coming to Japan. And now he is known as an active English teacher in various fields from kindergarten to high school as well as technical school. In the country’s largest chain of English conversation schools, he was ranked at the top of the list of “teachers who I want to be taught by” . Mr Normile speaks fluent Japanese as well so he introduces students to technical terms used in specific fields that are relevant to their assignment research. 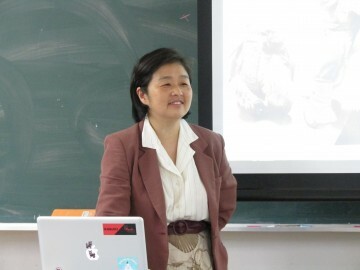 Ms Imanaka is in charge of the First Years’ SG English Presentation lectures. We have held a 2 hours class on Monday, around twice a month, this year. She is organizing an agricultural experience with lodgment, WWOOF, for non-Japanese people in Nose. She self-studied English before passing STEP 1st grade. She also holds a national qualification as a guide-interpreter. She is connecting the world to Nose while working steadily on the revitalization of Nose. * WWOOF stands for World Wide Opportunities Organic Farm and began in England in 1971 before developing further in Australia and New Zealand. In Japan, starting in 1994 originally, the internet played a big role in creating WWOOF Japan. WWOOF covers more than 100 countries. Each country has an office which makes a network of lodging agricultural experiences. WWOOFER, someone who uses WWOOF, applies online to farms for the experience and travels around the world. Continuing from last year, Mr Kern is in charge of the First and Second Years’ SG English Presentation lectures. The ten lecture course will start from the second term, on Saturday mornings. He is a language teacher from Edmonton, Canada, which is famous for its dramatic nature. He is bilingual, speaking both English and Japanese, as he grew up in both Canada and Japan due to his parents’ jobs. After graduating from a Canadian university, he came to Japan and completed his master’s degree in Japanese Studies at Osaka University. 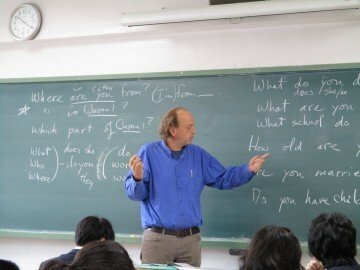 He has been teaching English language in schools from junior and senior high to language schools. He also teaches other subjects in Japanese such as cultural anthropology, comparative cultural studies and peace studies at Kwansei Gakuin University and Osaka Sangyo University. With the combination of fluency in Japanese and a detailed knowledge of various subjects like history of literature and sociology, he will bring a lot to the class and improve students’ presentation skills. On Wednesday April 27th, we held our Second Years’ 3rd SG focused-area lectures for the “Super Global Study” class. Continuing from the second instalment, we received a case studies lecture from Ms Ryoko Imaoka of Osaka University. The theme this time was “The blessings from livestock makes good use of grass in Mongolia”. In the first session, we learned about the five types of livestock in Mongolia – camels, horses, cattle, sheep and goats – which Ms Imaoka equated to the five grains of Japan. In the second session, we learned about nomadic principles and the perpetually-circulating Mongolia lifestyle that utilizes livestock. Ms Imaoka wrote each of our last names in the Cyrillic alphabet, which gave us a great opportunity to experience a familiar word in unfamiliar letters. She suggested that the self-sufficient lifestyle in Mongolian society is due to sustainable production and consumption, and that this will be the way the more people will live in the future. In further discussions, we are going to think about possibilities of sustainable production and consumption in Nose town. In the 6th lesson period on Thursday April 21st, the Second Years’ first SG Basic Knowledge lecture took place in the Audiovisual room. Our lecturer was Mr Shouhei Kobayakawa, a former member of the Japan Overseas Cooperation Volunteers and an inhabitant of Nose town. We had previously invited him this February, when he shared tales of his trials and tribulations abroad. This time, we received a talk about chestnuts in France which we could not hear in February due to time contsraints. Mr Kobayakawa had visited the town of Collobrières in France, which he told us very closely resembles Nose in its urban relations and the problems it faces in maintaining its chestnut woods. He hopes to apply the successful reforestation example of Collobrières to Nose. Although this issue is related to students’ life, there were some parts we could not picture clearly. However, if there comes a point where we will consider the chestnut harvest of Nose in the future, today’s meaningful lecture may provide us with useful ideas. During the first and second lesson periods on Wednesday April 20th, we held our Second Years’ 2nd SG focused-area lectures on the subject of “Super Global Study” (SGS). In this lecture series, we conduct case studies under the instruction of Ms Ryoko Imaoka, associate professor of Studies in Language and Society at Osaka University’s School of Language and Culture. Eleven Second Year students of the SG focused-area lectures are taking the class. 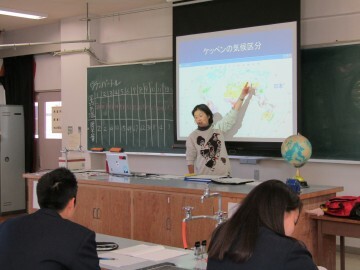 Ms Imaoka’s class began with a greeting in Mongolian, and consisted of lectures and workshops entitled “Universality of Mongolian Nature; Peculiarity of Japanese Nature”. Using climate classification, we learned about the climatic differences between Japan and Mongolia, and the relationship between the Mongolia climate and their nomadic culture. We created and compared climographs of annual precipitation and temperature in Ulan Bator and Nose. By coloring areas where livestock are raised on the world map, we realised that that livestock culture is prevalent throughout most the world, and that cultures that don’t rely on livestock, such as Japan, are in the minority. We also learned about human history from the dawn of humanity through the emergence of civilizations, and how have thrived with a blessing of livestock while cultivating grains such as barley. The lectures taught us how civilizations and cultures differ according to the natural conditions of their surroundings, and how humankind as a whole has developed. We ended the class, again, with Mongolian farewells. April 13th saw the commencement of the Second Year’s Super Global (SG) Focused-Area Lecture series of 2016. The first two class periods of every Wednesday will focused on the subject of “Super Global Study” (SGS). 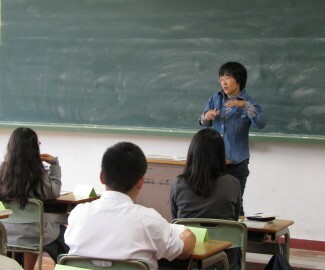 Mr Togashi of the English department and home economics teacher Ms Saito will conduct the classes. This Wednesday’s SGS class was the first lecture of the 2016 SG series. 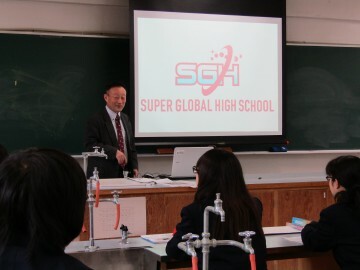 Vice Principal Mr Uchida held an orientation session to explain the purpose of SGH and outline the lectures and activities planned for this year. Also, by way of preparation for English presentations, the students in the class introduced themselves in English. This year’s lecture series has the theme ”Poverty and street children in Mongolia: mothers’ independence and children’s education”. They will study the issues of the “Manhole Children” of Ulaanbaatar, and beekeeping in Shaamar country of Selenge province, the most northern region of Mongolia. In addition, Ms Ryoko Imaoka, associate professor at Osaka University will, among other guests, hold lectures and workshops with the goal in mind of our students delivering presentations at the Mongolian National University of Education.